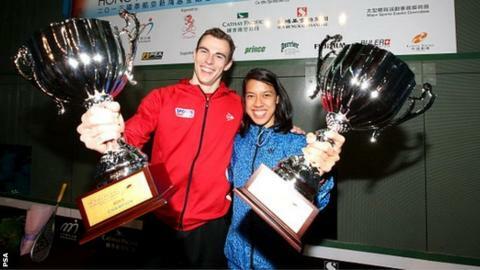 World squash champion Nick Matthew regained the number one ranking and claimed his first Hong Kong Open title with victory over Spain's Borja Golan. The Englishman, who won his third world title last month, saw off Golan 11-1 11-8 5-11 11-5 in the final. Matthew, 33, first topped the world rankings in 2010 and the Yorkshireman has now won 28 career titles. Malaysia's Nicol David won a ninth straight title in Hong Kong as she beat Raneem El Weleily 11-7 11-7 12-10. Matthew made his only other final appearance in Hong Kong nine years ago and had been thrilled to make the semi-final stage, when the event moves to an all-glass show court on the Tsim Sha Tsui harbour front. He went into Sunday's final as a strong favourite against Golan, the world number seven who was through to his first World Series final. The victory sees Matthew replace Egypt's Ramy Ashour, who has been struggling with injuries in recent months, at the top of the rankings. "It feels amazing," said Matthew, who was last ranked number one 22 months ago. "I've been coming here since 2001 and I've struggled to get out of the squash centre before now so to end the year on a high, with this title and going back to number one, is an amazing feeling. "It's been a great year for me: I got married this year as well so it's been really special for me. I think Ramy (Ashour) has shown that he is the best player, so I'll take the ranking with a pinch of salt. "I have to beat him on a regular basis and that's the next goal, but I have had my share of injuries and know what it's like for him. "I think Borja deserves a lot of credit for how he played in his first final. I think there was a lot of nerves in the first game and maybe handling the lights going out as well was maybe easier with my experience. "I had a great start in that first game so credit to him that he came back in the third. "He could have thrown in the towel but he came back and showed that he's got a lot of big matches in him and he's on an upward curve in his career for sure."